Our Einstein crystal award is dedicated to genius who posses creative spirit, ability to think outside the box, courage to explore into unknown and to question the familiar. This award futures a striking and dramatic combination of clear and black crystal. 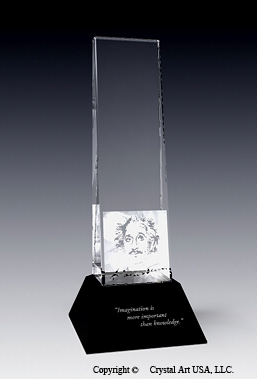 The portrait of the famous scientist and Einstein's signature are engraved on the clear obelisk part and his famous inspirational quote “Imagination is more important than knowledge” is engraved on the black crystal base of the award. Further personalization is available on the top portion of the clear crystal obelisk.